Does the BBC need to clickbait Arsenal fans with news of Wales midfielder Aaron Ramsey? The BBC says Ramsey is “set to leave Arsenal for Everton on a free transfer in the summer”. Wasn’t he heading to Manchester United, Spurs, Liverpool, Manchester City or Chelsea? Earlier this week, the BBC told its reader that Ramsey was “open to joining one of Arsenal’s top six rivals if he leaves Emirates Stadium on a free transfer in the summer”. Everton are not a top six side. And that was “if” not “when”. The BBC also told us that Real Madrid want Ramsey; and Liverpool and Man United were looking to get Ramsey in a “cut-price” deal this January. Now we’re told, Everton are “ready to offer the 27-year-old a £15m signing-on fee”. Says who? Says the Sun, which actually says nothing of the sort. 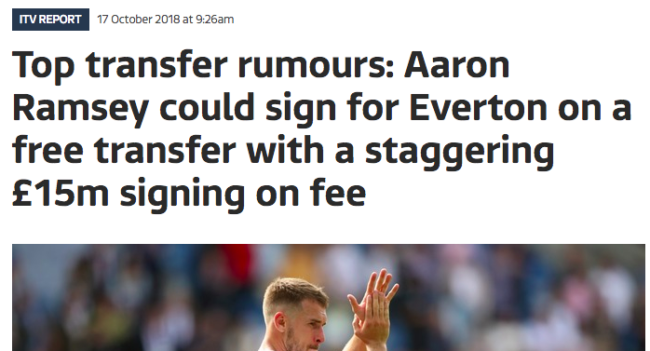 The BBC cites the tabloid as the source of its news, but when you head to the Sun, it tells us Ramsey “can command a stunning £15million signing-on fee.” He can. But will he? Everton could also pay the injury-prone player £150,000 a week to be “the main man in Silva’s midfield”. Ramsey wants £250,000-a-week to stay at Arsenal on a four-year contract, working out at £52m. The Gunners rejected that option to nearly double Ramsey’s current salary. And now Everton will offer him £15m plus £31m in wages – that’s £46m over four-years. Although the Sun doesn’t say how long any contract offer will be for – just as it doesn’t says Everton are going to offer the player a £15m signing-on fee.